WASHINGTON CITY – The Washington City Council approved a general plan amendment Wednesday that could allow for some potential neighborhood commercial development in the future in the area of Washington Fields Road and 2000 South. In a 4-1 vote, the City approved a general plan amendment allowing a 35-acre parcel of land between Washington Fields Road and Heritage Fields Drive to eventually be changed from a low-density residential designation to community commercial. This was done with a note that the city wants future development be zoned as planned unit development, or PUD, with 10 acres of the parcel potentially being used for commercial development. A potential PUD designation allows the city to retain greater oversight over what kind of development is done on the property. Whatever development there is would be scrutinized more by city officials than regular commercial projects. “The only way I would approve commercial there is through (a PUD) to where you did have control,” Mayor pro tem Jeff Turek said. The decision didn’t sit well with residents of Washington Fields, who made up the majority of those in attendance at the meeting. Once the vote was made, attendees filed out of the council chambers while also venting their frustration. “We want no commercial,” Washington Fields resident Tricia Webb said following the meeting. Washington Fields residents have long opposed any commercial development in the area. Many have said they moved to the area for the quiet and inviting character of the place. They fear that that unique character will be lost if the city allows for potential commercial development in the community. 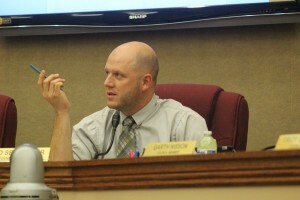 Councilman Thad Seegmiller said that Wednesday’s vote was amending the general plan only, and not a zone change. “All we’re doing tonight is saying this spot could be considered for commercial development in the future,” Seegmiller said, adding that the landowner could easily come back to the council at a later time and ask them to return the parcel to a low-density designation. Originally, the whole of the 35 acres was to be considered for potential commercial development, but was scaled back to ten acres during the City Council’s Feb. 10 meeting. 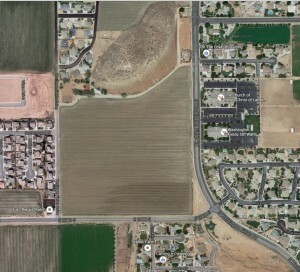 That 10 acres hugged the southeast corner of the overall property at Washington Fields Road and 2000 South. Part of the council’s vote included moving the 10 acres away from that corner and placing it on the northeast corner instead. The move sets it across the street from two chapels of The Church of Jesus Christ of Latter-day Saints. Moving the 10 acres allows for a buffer between it and the residential neighborhood on the south side of 2000 South. It also gets the parcel away from the busy Washington Fields Road-2000 South intersection, council members said. While he voted in favor of the general plan amendment, Councilman Troy Belliston said he agreed that straight commercial zoning shouldn’t be allowed in Washington Fields. If the city allowed that, it would open the door to further commercial development that could destroy the unique nature of the area, he said. “A Smith’s doesn’t fit there, but a farmer’s market in my mind does,” Belliston said. Councilwoman Kolene Granger said any development would be neighborhood commercial, meaning it would cater primarily to the immediate area rather than be a draw for people from outside of the neighborhood. Concerned residents have voiced worries about such commercial development in the area attracting additional traffic and potential crime, among other concerns. Councilman Garth Nisson was the dissenting vote in the 4-1 decision. Our elected officials are a bunch of bums. They have no regard for the people that elected them.